The Parrot and Sealion shows at Pleasurewood Hills have always been a popular attraction at the park and this year visitors will be able to see some feathered stars of film and TV. 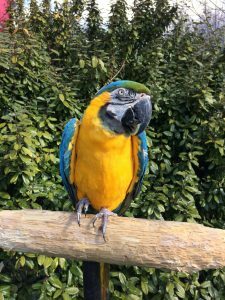 30-year-old Casper, a blue and yellow Macaw, swapped her usual perch at the park for a role in Paddington 2. The film follows the tale of the marmalade-loving bear and Casper can be seen ruffling her feathers alongside some high profile British actors including Hugh Grant and Julie Walters. Having enjoyed her 15 minutes of fame, Casper has been reunited with her old friend Woody – the park’s mascot who also happens to be a bear – and she will be starring in the parrot show for the rest of the season. This year the park has also welcomed some new visitors for the forthcoming season – three Great White Pelicans. The trio are no strangers to the spotlight and have already had a starring role in the ITV Drama The Durrells. The show is currently in its third series and follows the life of Gerrald Durrell and his family on the island of Corfu. Since arriving at the park, the pelicans have been getting used to life on the Suffolk coast and the trainers are preparing them for their next role – appearing in the Sealion show. As well as working with the pelicans regularly so that they are familiar with their environment, the trainers have been working to build up a relationship between the pelicans and the resident sealions so they can happily share the stage for the two live shows which happen every day the park opens.